When someone forgets to book the studio audience, Sam and Mark are left with time on their hands to reminisce over some of the highlights of the current series. What are you doing? Where are the audience? Oh, yeah, I was thinking that. Please tell me you didn't forget to book the audience. I didn't forget to book the audience. But did you forget to book the audience? I totally forgot to book the audience. Brilliant! How many times have we gone through this? -and you were going to book the audience. So, tell me, are you wearing lovely fresh underpants today? -Fresh as a daisy, mate. I put a bit of extra fabric softener in there for you. -But, anyway, listen, do we have any audience? Sorry doth butter no parsnips, my friend. The audience are the stars of the show. not the Studio Audience's Big Friday Wind-Up. Mark, of course they're the stars of the show. Listen, we can't have a show without the audience. and brought them down to win some fantastic, amazing prizes? -Are you ready for this, James? Left a bit, left a bit, left a bit. -Other way. Turn the other way. -Turn, turn, the other way! Turn that way! Forward, forward! The best of luck, Libby. We're all behind you, aren't we? -That's it, that's it, round you go. Don't forget the forward roll after you've done the jump. We'll give you that one, we'll give you that one. That's it, that's it! Come on, Libby! You're doing really well, really well. Come on. -Oh, missed it! Come back, come back! Get that one on the end, it's a bit lower. Come on, Libby! You can do this. You've got ten seconds left! -Come on! Quick, quick, quick! and get your hands in position. All right, your time starts now! I'm going to have jam on my cake. What are you using to put the jam on your cake? -Wow, that's a lot of jam. Are you sure that's enough jam? -You've got enough jam, what else do you want? Now I'm going to add the buttercream with the spoon. -Now, let me just... Get the spoon. There, there, get the spoon. Pour it on, just pour it on. -Maybe flatten it out with your hands, Mum. That's it! Now we're talking. All right, what else are we putting on? Spin it round, that's it! Lovely. All right. All right, darling, blindfold off. You've done very well, very, very well. Welcome to this very special Wind-Up mission with secret agent Joey. each of which represents a code letter. Can we bring the lights down, please? You get 45 seconds on the clock. Can you see the beams? -The best of luck, buddy. Nice. OK, put it in your bag, put it in your bag. -Be careful of that beam. Watch the beams. That beam is tricky. There's one above your head, be careful, Joey. Come on, mate, you can do this. Keep going under it, that's it. Good work. -In your bag. Get it in your bag. -A bit lower, bit lower. -You can do this. OK, good. You've only got five seconds left! -Come on over, Joey. Come on over, buddy. Joey! Would you believe it? chained up right under this vat of radioactive mega slime! But, Joey, not to worry because you can save him. from dropping on your dad by guessing the code word. your dad will be free, and you will win the star prize. the radioactive mega slime will make a right mess of your dad. Agent Joey, do you want to stroke the cat? OK. Agent Joey, we are about to reveal the letters that you found. You have just five seconds. Best of luck. It's going to be tricky, this. You stay back there, Joey. Best of luck. Here we go. Remember, you've only got five seconds. Oh, no! Which means the radioactive slime is going to fall on your dad! -We just took an "F" off, mate. -We only took the "F" off. -That's all we did, mate. -and we've got no studio audience to help us out. -it's not all about them, you know? We get some great celeb guests as well, remember? Oh, well, that's all right, then, isn't it? Apart from do you actually see any top celebs here? I'm talking about big celebs! -We need pop stars, we need actors. -Oh, all right. I could call someone. I've got all the numbers in here. My phone is like a Who's Who of telly stars. -I could call in a favour. -All right, who do you suggest? Oh, name someone, they're all in here. -He never calls me back. -I tell you what, I could call Pixie Lott. When she was on the show, I asked for her number. -She'd be a great guest. -I suppose it's worth a try. Go on, then. All right. What does "Number not in use" mean? Brilliant! What are we going to do now?! We need a celeb guest! Don't worry, mate. We'll think of something. Today's Celeb of Doom is Ben Shires. -..you must try to get to 60 seconds, OK? OK, how we doing? Chilly? What would you say the degree is of that water, temperature-wise? Oh, stop talking to me! -Is it in a bap or a...? A bap, a bap, it's not high-class. Come on, quick, quick, quick. Sam had the form last time. He blew and he blew and Mark's house fell down. Oh. Oh, it's here. Oh, he's making progress! Oh, no! I think we have a clear winner. Today's Selfie Stick Celeb is singing sensation HRVY. Snap a selfie with a kid pretending to scream. That's good, that's good, that's good. Pretend to scream, pretend to scream. Excellent stuff. What's your question for HRVY? -Who do you prefer, Sam or Mark? Mark's just stood over there doing nothing. -I love you the most. -I can't... I can't pick, I'm sorry. Health and safety rules will be broken here. Oh, get him in, get him in! Yeah! -Oh, no! We've got a question! what two people would you replace yourself with? -Oh, it's obvious, isn't it? -Sam and Mark, every day of the week! Snap a selfie with a mum with a massive smile. Massive smile! Over there, over there! Mind yourselves, mind yourselves. Coming through, coming through. -Go on, you choose, Rebecca, you choose. Oh, here we go. Massive smile, massive smile, biggest smile ever. Right, what's your question for Rebecca? -What do you have for breakfast that's healthy? Of course it counts! Do you have anything in it? Snap a selfie with a kid who looks like a little Matt Terry. Sam, you snap the picture. Who looks like Matt Terry?! Who looks like Matt Terry? Oh, yeah, go for it. Go for it. Go for it, go for it. Keep going, keep going, here we go. Yeah, yeah, we look alike. Hey, man, let's try and get a good one. Pull the same face, pull the same face. Excellent. What's your question for Matt Terry? Why did it inspire you to go on X Factor? "You need to do this for me." And I was like, "I'll do it." So I decided to go on for my nan. -Snap a selfie with a Dave. Oh, over there, over there! Go down here. You mind your step, mind your step. Yeah, that's what we call it in Canada. It's like pepperoni and salami and cheese. It does sound good. What's your favourite sandwich, Dave? Hold on, I want to know what Dave's favourite sandwich is, Mark! -Ham and cheese. There we go! to win the much coveted Wind-Up mug. -Who are you going for? Which picture? -I like the high five. I like the first one. -I'm going to leave it to you. -Oh, sitting on the fence. I like the high five! Here she is, she's coming down. We didn't ask you to come down and join us, but you can! -That's all right! I love it! -You've just won a big Friday Wind-Up mug! -She hasn't even got her mug! Brilliant. We'll get that mug to you. Oh. Mate, that's a terrible hiding place. I'll find you every time if that's the best you've got. -I told you, I'm not playing. -Because hiding is not entertainment. and you didn't know I was there? Remember that? to eat but shortbread for three weeks. Hey, remember? it was an old lady and I'd got the wrong house. Well, I suppose you wouldn't really, would you? OK. How about this time, you count to 100 and I'll go and hide? Mark! Watching someone hide is not fun. We've had some fun playing In Yer House, haven't we? playing pranks on our mates in Celebrity In Yer House. -Shall we reminisce about it? I'm going, I'm going! Bye! -OK, which way shall we go in? -This is nice for us, isn't it? -Both the girls are in the living room. I think it's Sam And Mark's Big Friday Wind-Up. Guys, the front door is locked! I'd try another door then, if I was you! She's already losing it, she's already losing it. Lauren, be very, very careful because there's two of them. -Upstairs, upstairs. Tilly's bedroom. Good taste. -There she is, there she is! Tilly's bedroom is on the right-hand side. -I'm in, I'm in, I'm in. You are in position number one. Well done. Here comes the hard work. you will see Tilly's hamster, Fuzzbella. Yeah, I can see a cage. Are you so familiar with Fuzzbella? Say hello to Fuzzbella. Oh, hey, Fuzz. Hey, Fuzzbella. you will see a camera. We need you to take a stylish selfie with Fuzzbella. we want you to put that photograph on top of the cage. Come on, then. Come for a selfie with Lauren. -..and get a really good selfie. The better the selfie, the better the challenge. Good girl. Come on, then. on the wall you may notice a picture of two very handsome men. -With A Little Help From My Friends. in your survival kit you will find a marker pen. and you need to sign it for Zara and Isabel. Try not to break all the other pictures. Show it to the camera. Let's have a look. So that's it, take it out the frame and sign your face. The girls are still in the living room, they're in the living room. -Oh, what are you doing, man? Make sure you remember how it goes back together. So sign your lovely little face. Just writing, "Lots of love". -I've got to sign it, haven't I? Trust me, they don't just want your autograph. -So what am I doing now? Oh, this is so hard! OK, come on, then. Oh! I made a noise then. but the living room door's open, so best of luck. -HE SHOUTS: Mark's in your house! OK, for the next challenge, Lucy is playing along. I want you to head into his office. ..now! Go, go, go, go! Quickly, quickly! All right, Sam, well done. You've done really well there. -What are you doing drinking his tea? -It's nice, just how I like it. No, no, put it down, you've got a challenge to do. -Sure it's not for you? -It's ordered in my name. -My name is not Chris Johnson. there's a little tea party thing. and then just let him have a little tea party. Lovely teapot, lovely little teapot. Well, Batman's coming to the tea party, deffo. I knew you wanted one. I want a TARDIS, I'm not sure about this one. He's invited giant David Tennant. -Oh, my favourite, Spider-Man, excellent. Oh, you've just broken him. Oh, he's coming up, he's coming up. OK, Sam, quickly go and get back into the box room for me. Sam, Chris is bringing up his delivery. Are we thinking new entrance to the bathroom? that is the only time you are going to be able to get out. There's a bunch of toys in the middle of the room! OK, that is genuinely really weird! where it's meant to be? and get back to the van. Come on, come on, come on. OK, we're guessing Katie's in the bedroom. We've not put cameras in her bedroom. We can't see Katie at the minute, so I'm guessing she's in there. Mate, if I were you, I'd get in the living room. Yeah, good man, good man, get behind the door, get behind the door. Right, just let Bramble go, see what happens. Oh, it's just looking at Mark! he might be able to help you out a little bit. He's coming into the room. -Alex is helping you out, mate, this is beautiful. Look at this! I swear I haven't set this up. -How has it got in? -Katie's now in the kitchen. This is brilliant. It was just at the bottom of the stairs, I swear. Was it not in the box? that is mission three complete! You don't think we shut it in last night, do you? that they accidentally shut that dog in last night by accident! Right, this is really weird. -Is anyone in the pantry? Mark, stay where you are, stay where you are! Well, how would something just come in our house? -Right, you go upstairs, I'll check it out. She's coming in the living room, stay behind that door. -I don't know, I'm trying to see. I want to make things really tricky for Mark. telling her that Mark is in her house! Hang on, is the front door open? "Hi, Katie Thistleton, hope you're well." So if you just came down, where was the dog? "Mark is hiding in your house right now." It was in that corridor. -I'm so sorry! Are you all right? Ah, look at that beautiful creation. And then we have, there we have it. Well done, Radzi, very good. -As part of the challenge, you need a Blue Peter sticker. we want you to stick that sticker on one of them. Obviously! I'd hurry up because dinner is ready. are going to be making their way into the dining room. Left corner, Mum's helping you out, there you go. Mum is going to be bringing the kids in for dinner very, very soon. Radzi, they are on their way. Oh, no idea, no idea yet. -She's not found him yet! -Do you have any idea what's going on? Mate, I've got to say, wonderful effort! How you doing, guys, are you all right? You're a bit in shock, I would imagine? -Radzi here has been hiding in your house! Does your dad not normally smile?! Sam, look what I found in the back of the wardrobe! -No, just loads of this cool stuff in here. Wigs, funny glasses, loads of stuff, mate. What are we meant to be doing with wigs and funny glasses? You put them on, don't you? They're hilarious, look at that. -Will you stop being silly?! -You're making a fool of yourself. there's no need to get all snappy with me. Sorry, I'm just... I'm just not in the mood, all right? -You know what will cheer you up, don't you? -You look brilliant! Do you feel any happier? Oh, well, give it a few minutes. I, for one, think you look fantastic. Will you give it a rest, Mark?! -You are making me look a fool. And here on Wind-Up, we are not in the business of embarrassing people. Round One - Word Up. trying to talk teen slang, innit tho? must try to use a cool teen slang word in a sentence. will be awarded a point by a panel of three independent real kids. -Hey, real kids, are you real? -Of course you are! Dads, are you ready? to write down your sentence, using the word YOLO. Harriet thinks you know this. To be fair, he's not wrong. He might be embarrassing, but he's a comedy genius! Not bad at all, that. Adam, any better? How YOLO can you go? -Oh, like it! Another good answer there. for the correct use of the word YOLO. "which is a James Bond film from 1967." Round two - Eggy Dance-Off. In that case, three, two, one, show us your moves! Round three - Special Eggy Skills. skills to embarrass to the max. What are you going to be doing for us? -I'm going to be ripping some jokes. -And, Ste, what are you going to be doing? -I'm going to be doing a bit of singing and dancing. He's loving it, he's loving it! it's your last chance to embarrass. I don't think you need to do anything else, to be honest! LAUGHTER Best of luck. Take it away. -Oh, that's pretty, pretty eggy. But, Ste, can you do any better? This man's made for the stage, I don't know! Well, best of luck, it's time for you to get yourself ready, Ste. -I was not expecting this. Nope, I wasn't expecting that either. Best of luck, this is your final chance to embarrass. We've got a whole show to fill here with no audience. -I could tell some jokes. I could dance, I'm a brilliant dancer. -Cooking - cooking's always popular. I could whip up a souffle. -What about rapping? I'm a good rapper. It could be a bit of an exclusive for all the Wind-Up fans! -We've already got it. Watch this. I didn't know we had that. You know nothing, Mark Rhodes. That was great. Come on, mate, what else can we do? Oh, I don't know. Maybe we could play a game! -Yeah, that will pass some time, won't it? is famous for playing amazingly funny games. -something that just you and I can play. -OK, how about, Hang On? Yeah, but we're missing two 20-foot crossbars. your earlier suggestion of hide and seek. and hide and seek doesn't sound like such a bad idea, after all. I'll count to 100, and then I'll come find you! -Ah, brilliant! No peeking now! That should buy me an hour or so. -Sing it! You've got to sing! -Come on, Dez! Here we go! Dez, what happened there, man? -I don't like getting wet! -He doesn't like getting wet! What a great game to go on! and then I'll say "Hang on". but only when I say "Hang on". OK, the best of luck. In three, two, one, hang on! Miss Watson and Tracy, very stable. Oh, we've got a swinging dad here. Oh, he's gone, he's gone, he's gone! Are you all right, mate? OK, tricky, tricky. OK, we've got Alan over here. -It is between Alan and Miss Watson. Come on, Miss Watson, you can do it! This is brilliant, this is tremendous! Come on, Alan! Hang in there. She ain't going anywhere! She ain't going anywhere! It's really good, it's really good! Three, two, one, hang on. OK, go for it, go for it. Oh, oh. Go on, pelt him, pelt him! Oh, good one, good one. -Both dads are looking solid. Oh, in the face, in the face! Oh, good one! He's doing tremendously well. -Oh, this is getting to the business! Look at that, right on the chest. Oh, wow, this is strong, this is strong. Oh, we have a winner! Unlucky, mate. Chris and Ella are our winners! Counting. In my head, with my eyes closed. Yeah, yeah. Anyway, I thought you were hiding. I was hiding. I was hiding in the prop cupboard. You'll never guess what I found - these cards. -Look how lucky we are. -We're not lucky at all, are we? We could play a card game. No, you're all right, thanks, mate. I've got it, I could do a card trick. Or I could punch myself in the face over and over again. Er, excuse me, I'm quite the magician. Look at one card, just one card, look at it, memorise it. -Have you got it, have you got it, have you got it? All right, three, two, one. Whee! There's nothing in my inside pocket. -Oh...no problem. What about this one? -Is it in the vicinity? -Oh, this is just pointless! You can't even do a simple card trick! Oh, yes, I can, I just need a few more guesses. Is it this one? while you lag behind relying on me to make you look good. That's a bit harsh. We both worked very hard on those Face-Offs. -Well, I've just had enough, all right? -Yeah? Well, so have I. Seems like there's not very many places to storm off to in here. Still very cross with you, though. Is this your card? -They'd better hope for a very quiet ride indeed. Wait, wait, wait! Listen, listen, listen! They don't make any noise! This is it, this is the big corner, this is the big corner. That was a scream! It was a scream. I heard a scream. -I confirm there were definite screams there. It happened before and yet it was still scary. -There was another one there. There was definitely another one there. Whether that's enough to get them the points we're yet to find out. ..the winner is Sam and Mark. -I'm as surprised as you! And I didn't even go on it! through their paces in an attempt to teach them some winning routines. -Get it, get it, get it. Too much. -I'm glad I had two sausage rolls for lunch. But will their efforts be enough? Will our seniors ever dance in time with anyone else? it's Team Sam and Mark. and the boys have put themselves front and centre. for a Friday night out in Barnsley. Time for Dave and Ted to show the kids how it's done. Wow, an awesome display from Team Sam and Mark! Naomi and Ed will have their work cut out if they want to match that. Whoa, leapfrog! Are you having a laugh?! Team Naomi and Ed tear straight into it with some great synchronicity. Yeah, that's it, you guys chill whilst the kids do the work. These guys are really working as a team. Sam and Mark must be getting worried. -What are they doing here?! We can do the running man as well! before John gets his chance to shine. They're just doing this, they are just doing this! Sam and Mark are nervous as the blue team head for their big finish. It's an awesome group display for Team Naomi and Ed. -It was boring. It was boring! Pink Team all the way, man! Pink Team all the way! They were just doing this. -Yeah, I would imagine it is. Can't touch this, can't touch this! a challenging downhill race complete with twists, turns and chicanes. with a ten second advantage for Team Lindsey and Karim. But can Team Sam and Mark overtake? -That's your advice to me? Up comes Sam to the start line. Good luck, mate. Come on! And he's off and already starting to pick up speed. Down to the first chicane. He goes for the ramp. -Sam's off to a flyer and here comes Karim. He's showing off, he's doing no hands. Karim's made a lightning start as he attempts to set a quick time. Karim breezes over the ramp. in a time of one minute and seven seconds. That's a great time, but what can Karim do? but his time is a little slower than Sam's. Although try telling him that. Smashed it! Absolutely smashed it. That was awesome. by at least seven seconds. I'm feeling pretty nervous now. -Because you did really well. Linds, this is your bag, right? How are you feeling? -I can't move my face with this helmet on. We've got to beat them by about ten seconds. start as he attempts to claw back those crucial seconds. But is Lindsay determined enough to keep her and Karim's lead? -Oh, I'm going quite fast! -her and Karim in the race. -Nearly got a hay bale there! of the course to keep their speed up. Mark is on to the second ramp and it's another smooth landing by him. but has he managed to go seven seconds faster than Lindsey? -But was it good enough? -Wow, how slow was Lindsey?! I'm sorry, mate, I shouldn't have said those things. You were always a big help when it came to the big Friday Face-Offs. I found your words very cruel. I know, but listen, we can all be cruel sometimes, can't we? -You are, we both are. -Of course we are, yeah! But we've just got to remember it's a laugh. -We mean no harm by it. only we knew she'd never heard of him! That was funny, that was! That was brilliant, actually. and accidentally singed off her eyebrows in the car park. in the Wind-Up studio audience. What are you talking about? and, go on, show us, what's he done to your head? He did "CBBC" on the side of my head. Look at that, he's shaved it into his head! All right! And...Callum, we know that you can do the worm. Not exactly what we thought you were going to do! And, Freya, we know that you can wiggle your ears. Go on, give us a wiggle. -Using her hands! I can do that! -Anyway, we still knew it about you. Or, Peggy, you can do a mean running man. Let's have a look, let's have a look at your running man. can put your legs behind your heads. Go on, show us. Ben, you can do a twisted arm thumbs up. Show us. -I like it, I like it. I can't do it, I can't do it! for a certain Mr Sam Nixon. -Is this true, is this true? -Come on, off you go. Oh, this is embarrassing. Oh, deary-me! Hi, Julia. I'll sit on there, don't you worry about that, love. How are you doing, love? You all right? -Oh, thank God for that! -No, I want to stay here forever. Who's about to become George DeAngelo from LA. to avoid hurting George's feelings. Or will she just straightaway say, "I don't know who he is"? So, audience, you're in on this, OK? go absolutely wild, like he's the biggest star in the world, OK? # Can I just have one more moondance with you, my love? Whoa, George! It's an honour, it's an honour. How are you feeling, because we know you're a massive fan, aren't you? Coco, this is a very special young lady. I was performing in Madison Square Gardens. -and you love me, do you remember that? Coco, obviously we know you're a massive fan of George. -He is so romantic, isn't he? How many times have you been to see him in concert? -I think it's just once. -Just the once, just the once. I'll always remember that moment, Coco. We've been winding you up. This isn't George DeAngelo because he doesn't exist! This is just Sean from London. because you played along! You didn't want to hurt his feelings. A round of applause for Coco! Give it up for Coco and Sean! Lovely. Yeah, I suppose it hasn't been a bad old series. We've had some right laughs. but you are a good friend. that the studio audience didn't turn up. It gave us chance to hang out. so it gave us a chance to reconnect. Hang on, did you really? Oh, you silly sausage! Do you know what? It's been an honour recording the series with you. You too, mate. Until next time. Put that away, you. Come here. Give it up for Sam and Mark! -Have a look behind you. Pull your trousers up! Pull your trousers up! 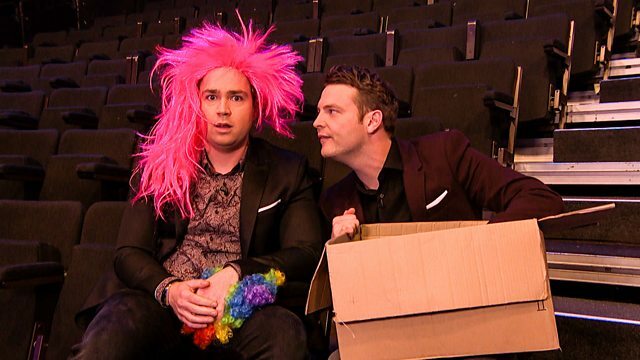 When someone forgets to book the studio audience, Sam and Mark are left with time on their hands to reminisce over some of the incredible highlights of the current series. It's been emotional.